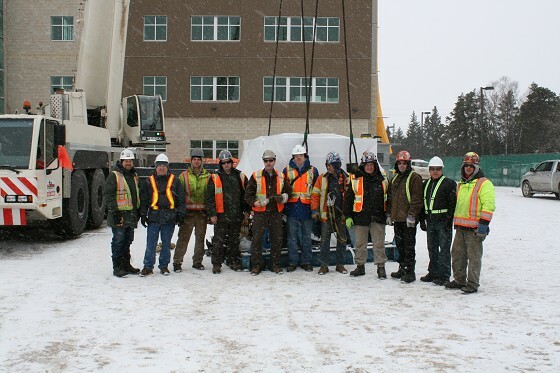 Under snowy conditions, the $3.5 million, 28-tonne cyclotron arrived in Thunder Bay and was installed into its new home at the Health Services Centre located at 1040 Oliver Road. "This is an exciting day for everyone who has worked so hard to bring the cyclotron to Thunder Bay”, says Mike Campbell, Director of Cyclotron Operations, Thunder Bay Regional Research Institute (TBRRI). “It is an honour to be involved with this project knowing how much work people have done to ensure its success". The arrival of the cyclotron is the latest in a series of milestones designed to ensure the availability of medical isotopes for patient care in Northwestern Ontario. The cyclotron will also usher in a new era of research at Thunder Bay Regional Health Sciences Centre (TBRHSC) and the Thunder Bay Regional Research Institute (TBRRI). Products produced by the cyclotron will be used by scientists to create new and more informative diagnostic agents that will allow physicians to provide better patient care and more personalized therapies. "The cyclotron brings a unique opportunity to TBRHSC and TBRRI”, says Andrée Robichaud, President & CEO, TBRHSC, and Acting CEO, TBRRI. ”It gives us the ability to ensure we have a supply of medical isotopes for our patients and support research that puts the patient first." Financial support for the cyclotron has been provided by the Northern Ontario Heritage Fund Corporation (NOHFC), FedNor, The City of Thunder Bay and the donors who contributed to the Health Sciences Foundation’s Exceptional Cancer Care Campaign. "We are excited that the cyclotron is here and can soon be used to provide enhanced care to patients in Thunder Bay and Northwestern Ontario,” says Glenn Craig, President & CEO, Thunder Bay Regional Health Sciences Foundation (TBRHSF). “Our generous donors helped make this day possible. They contributed $2.2-million to the cyclotron through the Exceptional Cancer Care Campaign and are very proud of being part of this important milestone." During the spring, the public will get an opportunity to view the cyclotron and the facility up close. A series of open houses will be taking place in late March or early April to allow the public to tour the facility in the Health Services Centre and learn more about how this unique machine benefits patient care and the local economy. The exact dates and times are still in the works and will be promoted later this month.